To close this health access gap, the California legislature is considering a proposal (Senate Bill 1005, the Health for All Act) that would expand Medi-Cal coverage to include primary and preventive care, prescription drugs, mental health care, dental care, and other routine health services for all low-income California residents regardless of immigration status.2 The expansion of health services would build on existing federal and state funds spent on emergency and pregnancy-related care, available under federal policies that have been in place since the 1980s.3 The policy would also shift services from an episodic fee-for-service delivery and payment model to managed care plans. California has recently taken a lead in adopting state policies that expand the rights of undocumented immigrants, who make up 9 percent of the state’s workforce and pay more than $2 billion in state and local taxes annually.4 The proposed policy would continue that advancement. The new spending would be substantially offset by an increase in state sales tax revenue from managed care organizations, in addition to savings from reduced county spending in providing care to the uninsured. The net increase in state spending is estimated at between $353 and $369 million in 2015, growing to between $424 and $436 million in 2019. Enrollment in Medi-Cal would increase by between 690,000 and 730,000 individuals in 2015, growing to an increase of between 750,000 and 790,000 in 2019. This enrollment would reduce the number of uninsured Californians by approximately one-quarter in 2019. The estimates in this brief are based on the best available data on the demographics, health coverage, and health services utilization of undocumented Californians, including projections from our UC Berkeley/UCLA California Simulation of Insurance Markets (CalSIM) model and administrative data from the California Department of Health Care Services (DHCS). However, because data sources on undocumented immigrants typically have limitations, 7 the estimates in this brief are subject to some uncertainty. This analysis assumes that the expansion would be structured to “wrap” the new services around the existing emergency and pregnancy-related services, thus maintaining federal matching dollars for the episodic services currently provided to undocumented residents. We also assume that all services would be provided in a comprehensive way through managed care plans, instead of the current disjointed system of fee-for-service emergency care. Various options could be considered in order to provide the services through managed care while continuing to maintain the federal match for the emergency and pregnancy-related services. The incremental cost of the “wrap” is the difference between: (1) the cost of a managed care plan providing the same comprehensive services as other Medi-Cal plans, including all essential health benefits, specialty mental health services, and certain dental services, and (2) the cost of restricted-scope (primarily emergency and pregnancy-related) services currently paid on a fee-for-service basis. 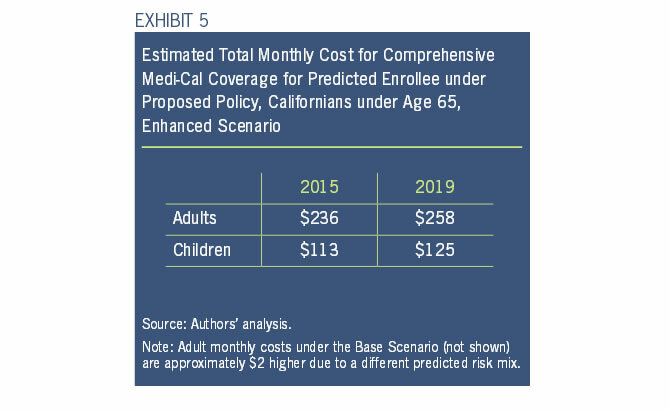 The incremental monthly cost of providing comprehensive Medi-Cal coverage per adult enrollee is estimated to be $94 in 2015 and $101 in 2019.13 These cost estimates reflect DHCS cost estimates for families in 2014-2015, separating out adult costs and making the following adjustments. Costs are reduced by the current monthly spending on restricted-scope services adjusted for inflation. Costs are adjusted for the age of adults expected to enroll in Medi-Cal under the proposed policy compared to the age of adults currently enrolled. Costs are increased to reflect that some adults with disabilities may newly enroll in coverage. This adjustment assumes that individuals with disabilities who have the highest health needs are already receiving services. Expanding preventive and routine health services to children is predicted to involve no additional costs to the state. The cost of comprehensive Medi-Cal coverage for children (approximately $133 per month in 2015) is lower than the estimated cost of restricted-scope Medi-Cal for children (approximately $138 per month in 2015), based on an analysis of data from DHCS.17 Past research found that immigrant children have lower health care utilization than their U.S-born counterparts,18 indicating that the cost of comprehensive coverage for undocumented children would be lower than $133 per month. These data suggest that providing care to children in a more rational way under a managed care arrangement is likely to cost less than providing emergency-only care to children. Using CalSIM version 1.91, we predict the number of Californians who would be newly eligible for comprehensive Medi-Cal coverage if eligibility were expanded to include all low-income residents regardless of immigration status. Under current Medi-Cal eligibility standards, low-income individuals are those in households with incomes of up to 138 percent of the Federal Poverty Level (FPL) for adults, or approximately $16,000 for a single individual, and up to 266 percent FPL for children, or approximately $62,900 for a family of four. Of the more than 1.3 million Californians estimated to be newly eligible under this proposed expansion, between 690,000 and 730,000 would be predicted to enroll in Medi-Cal in 2015, growing to between 750,000 and 790,000 in 2019 (Exhibit 2). Nearly all (97 to 98 percent) of these predicted enrollees currently lack comprehensive coverage. Approximately one-quarter of all undocumented Californians already have private coverage through their own job, a family member’s job, or the individual market.24 More than 140,000 undocumented Californians who would be eligible under the proposed policy have job-based coverage and few of these individuals are predicted to switch to Medi-Cal. A small number of low-income undocumented Californians purchase coverage in the individual market and most of them would be expected to switch to Medi-Cal if they became eligible for comprehensive coverage. 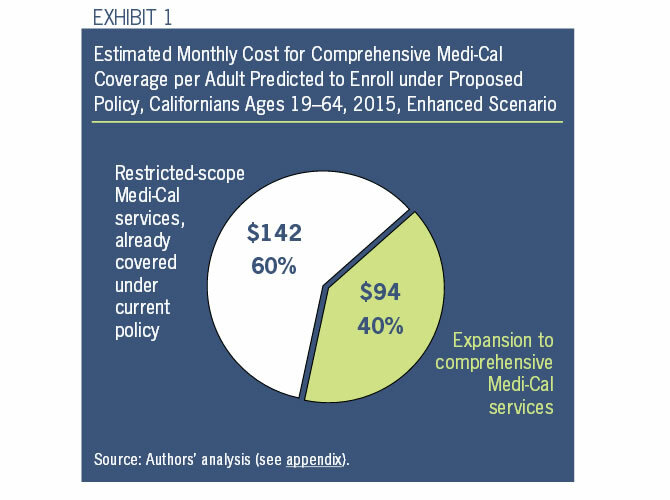 Among childless adults not previously enrolled in restricted-scope Medi-Cal or other coverage, between 20 and 30 percent are predicted to enroll under the proposed policy in 2015, rising to between 30 and 40 percent in 2019. Parents are predicted to take up at similar rates in the Base Scenario and somewhat lower rates in the Enhanced Scenario, compared to childless adults. Children are expected to enroll at a higher rate than adults.25 These enrollment rates in part reflect the previously-discussed fears and concerns that undocumented immigrants have about enrolling in public programs. While these rates are relatively low compared to overall enrollment rates for low-income uninsured individuals, they are somewhat similar to the enrollment rates predicted for California citizens and legal immigrants who were previously eligible but did not enroll in Medi-Cal prior to the ACA.26 This is a relevant point of comparison because the undocumented Californians who fall into this category are already eligible for restricted-scope Medi-Cal without the proposed policy but have not enrolled. In 2019, enrollment is predicted to be somewhat higher due to growth in the California population overall, and due to enrollment growth as individuals learn about the program and their eligibility. Over time, it is also possible that fear of negative immigration-related consequences for enrolling in public programs could decrease somewhat as a result of this proposed policy and other state policies like the law expanding driver’s licenses to all Californians. Approximately 640,000 Californians were enrolled in restricted-scope Medi-Cal prior to the ACA, excluding estimated pregnancy-related enrollees and individuals with DACA expected to enroll in Medi-Cal.28 Therefore, under the proposed policy, between 50,000 and 150,000 additional undocumented enrollees are expected (depending on year and scenario), above and beyond the number of pre-ACA restricted-scope enrollees. 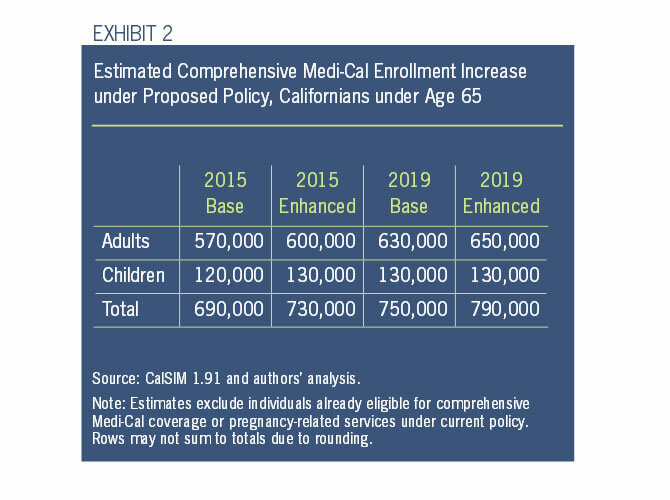 The estimates in Exhibit 2 reflect the effect of the proposed policy, in addition to the expansion in restricted scope Medi-Cal eligibility under the ACA (childless adults and some parents became newly eligible). The new state spending to expand comprehensive Medi-Cal coverage to all low-income Californians would be substantially offset by new state tax revenues and reduced state spending on indigent health care under the existing Health Realignment funding policy. California levies a sales tax on Medi-Cal Managed Care Organizations (“MCO tax”) equivalent to 3.93 percent of gross premiums.29 The predicted increase in Medi-Cal managed care spending that would be generated by the proposed policy would increase state sales tax revenues by up to $78 million in 2015, growing to up to $83 million in 2019 if the sales tax is maintained (Exhibit 3). New state spending would also be partially offset by reduced county spending on the uninsured. Counties receive Health Realignment funds from the state to implement public health measures and provide indigent health care to uninsured residents. Expanding eligibility for comprehensive Medi-Cal coverage to all low-income Californians would increase Medi-Cal revenue for health care safety net providers, including public or countycontracted providers, and would decrease spending on providing care to the uninsured. In the ten counties that currently offer non-emergency services to undocumented residents and which have chosen a “formula” option for their Health Realignment funding changes, the state would capture a portion of county savings as county residents gain coverage under the ACA. The mechanism established under this state law would naturally capture some of the savings from the reduction in uninsured undocumented residents in the ten counties. Limited data is currently available on the impact that the ACA has had or will have on county indigent care spending, county health care revenues, and the number of patients utilizing services within the public health care safety net system. Based on the information available, it is estimated that up to $233 million in Health Realignment funds could be redirected to other purposes in 2015 if the proposed policy were adopted (Exhibit 3). This estimate assumes that at least three-quarters of new Medi-Cal enrollees in these ten counties would use public or county-contracted providers, resulting in most of the new Medi-Cal revenue directly or indirectly accruing to the county. If additional counties began to offer or reinstated non-emergency services for undocumented residents and if those counties are allowed to incorporate those costs into their Health Realignment formulas, the savings could be higher. Conversely, the state budget savings could be lower if some of the ten counties incur no savings under the ACA or if some counties achieve savings that are high enough to reach the limit of Health Realignment savings that can be redirected to other purposes. The proposed policy could entail other state budget offsets that are not quantified in this brief. For example, under the ACA, Medi-Cal participating hospitals are now able to preliminarily enroll patients who may be eligible for Medi-Cal based on their income and provide temporary Medi-Cal benefits for up to 60 days (“presumptive eligibility”) while a full eligibility determination is completed. To the extent that any individuals who are eligible under the proposed policy are deemed presumptively eligible, the state would receive federal matching funds for any services provided during that 60-day period, potentially reducing the net state spending. California has recently adopted a series of state policies that recognize the important contributions that undocumented immigrants make to the state and its economy. In 2011, the state enacted a package of state DREAM Act laws extending student financial aid benefits to undocumented immigrants who arrived in the U.S. as children. In 2013, it enacted a law providing access to driver’s licenses for all California residents. California also has a history of extending state-funded Medi-Cal to certain immigrants who are left out of the federal Medicaid program, such as recent legal immigrants and young immigrants eligible for DACA. The proposed policy to expand eligibility for preventive and routine health services to all low-income California residents regardless of immigration status would continue California’s practice of leading by supporting state policies that advance immigrants’ rights and expand health care access. This proposed policy would require a modest state investment for a significant gain in coverage and health. The investment would be equivalent to a 2 percent increase in state Medi-Cal spending for an enrollment increase of up to 7 percent in 2015. The proposed policy would be predicted to increase enrollment in comprehensive Medi-Cal coverage by between 690,000 and 730,000 in 2015, with a net state spending increase of between $353 and $369 million in that year. The expansion of comprehensive coverage would reduce California’s remaining uninsured population by approximately one-quarter. This Medi-Cal expansion would increase access to needed preventive care for hundreds of thousands of California workers and children. The policy would build upon existing federal and state funds to provide more timely and effective preventive and routine care–improving population health and potentially reducing avoidable hospitalizations. Providing access to comprehensive health services for all low-income Californians would be a substantial step towards a healthier state. This policy brief uses the California Simulation of Insurance Markets (CalSIM) model, version 1.91. The model is designed to estimate the impacts of Medi-Cal coverage in the CHIS was calibrated to match California Department of Health Care Services (DHCS) enrollment data for undocumented aid codes from Fiscal Year 2011-2012 and then in various elements of the ACA on employer decisions to offer insurance coverage and individual decisions to obtain coverage in California. CalSIM uses data from the Medical Expenditure Panel Survey Household Component, the California Health Interview Survey (CHIS), firm-level wage distributions from the California Employment Development Department, and the California Employer Health Benefits Survey to build a California-specific model. For further information, please visit http://healthpolicy.ucla.edu/programs/healtheconomics/projects/CalSIM/Pages/default.aspx. Estimates of the number of Californians remaining uninsured due to immigration status are higher in Version 1.91 than in previous versions of CalSIM. They differ because in Version 1.91 undocumented individuals who report having Medi-Cal coverage to the CHIS are assumed to have restricted-scope Medi-Cal and are treated as uninsured because they lack comprehensive coverage. For this analysis, sample weights within the Version 1.91 were adjusted in two significant ways to account for the factors important to estimating increased Medi-Cal enrollment under the proposed policy. First, the fraction of undocumented residents at or below 138 percent FPL was set to match the 2011-2012 CHIS. Second, the number of undocumented residents who reported having increased slightly to account for population growth. Unverified citizens and legal immigrants enrolled in undocumented aid codes could not be identified and would be counted as undocumented enrollees. To the extent that this occurs, the eligibility estimates in this brief are conservative. These two additional calibrations result in a slightly modified model that is better equipped to accurately make predictions regarding the undocumented residents in the state. 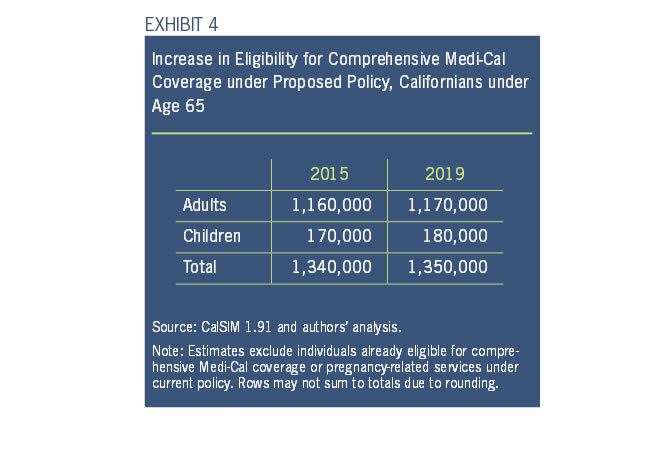 The predicted number of Californians eligible for comprehensive Medi-Cal coverage under the proposed policy is shown in Exhibit 4.
will grow over time. Current Medi-Cal enrollment data for individuals with DACA are not available, though recent research suggests that many individuals with DACA are not yet aware of their eligibility.35 It is predicted that approximately 80,000 teens and young adults would enroll in 2015 if they enroll at the same rates as other undocumented residents are predicted to enroll under this analysis. To validate the eligibility estimate in this brief, we examine another estimate of low-income undocumented Californians that uses a different data source. CalSIM 1.91 estimates that 1.5 million undocumented Californians would be eligible for Medi-Cal under the proposed policy, including pregnant women and individuals with DACA. Data from Pastor and Marcelli’s analysis of the California undocumented population using American Community Survey data from 2009-2011 indicates that approximately 1.4 million undocumented Californians live in households with income below 150 percent FPL.42 This estimate includes some adults with income between 139 and 149 percent FPL who would not be eligible for Medi-Cal under the proposed policy, but it also excludes children living in families with incomes between 150 and 266 percent FPL who would be eligible. When adjustments are made to roughly account for the different income ranges examined, the two estimates appear relatively close. No existing research is available related to Medicaid enrollment rates for undocumented immigrants because undocumented immigrants are generally ineligible for comprehensive Medicaid coverage. However, one point of comparison for child enrollment rates is past enrollment in the Los Angeles (LA) Healthy Kids program for uninsured children living in families with income below 300 percent FPL. The LA Healthy Kids, Medi-Cal, and Healthy Families programs are comparable because all programs were open to children up to age 18, the income eligibility ranges are relatively similar, and there were no enrollment caps in any of the programs in June 2005 (though LA Healthy Kids capped enrollment immediately thereafter). However, the difference in enrollment rates is unlikely to be entirely attributable to immigration status. For example, the Medi-Cal and Healthy Families programs could have had higher enrollment because the programs are statewide, making the programs more visible. Additionally, Medi-Cal is open to parents which could increase enrollment among children. To the extent that new individuals enroll in Medi-Cal due to the proposed policy, they are likely to be individuals with less need for restricted-scope services because they had not already enrolled in restricted-scope coverage. Of the new enrollees who use restricted-scope services, many would have been likely to newly enroll in restricted-scope services in the absence of the proposed policy because we assume that providers generally assist individuals seeking emergency or pregnancy-related services with enrollment in restricted-scope Medi-Cal if eligible. In 2014 through 2016 the federal government will pay all of the costs of restricted-scope services used by childless adults and parents who are newly eligible for restricted-scope Medi-Cal under the ACA. The federal share of costs will decrease to 93 percent by 2019. Age and disability adjustment: In CalSIM 1.91, the adult cost estimates are adjusted for the ages of the undocumented adults expected to enroll in Medi-Cal under the proposed policy compared to the non-disabled citizen and legal immigrant adults predicted to enroll under current policy. The adult cost estimates are also adjusted to account for the higher cost of individuals with disabilities who may newly enroll in comprehensive coverage under the proposed policy. This adjustment is necessary because individuals with disabilities are not included in the Mandatory Expansion cost estimates used as the basis for this analysis. The disability adjustment factor is assumed to be one-quarter of the Medi-Cal cost difference between non-elderly disabled and non-disabled adults.50 Only a fraction of the cost difference is used because approximately half of undocumented residents with disabilities reported already having Medi-Cal coverage51 and it is assumed that individuals with disabilities who have the highest health needs are more likely to already receive services. Many of the services are assumed to be provided through programs financed separately from restricted-scope Medi-Cal. No incremental difference in costs was included for children with disabilities because they are already eligible for the California Children’s Services program. Subtraction of restricted-scope costs: The total costs per enrollee are reduced by the estimated cost for restricted-scope benefits, which are already covered under current policy. 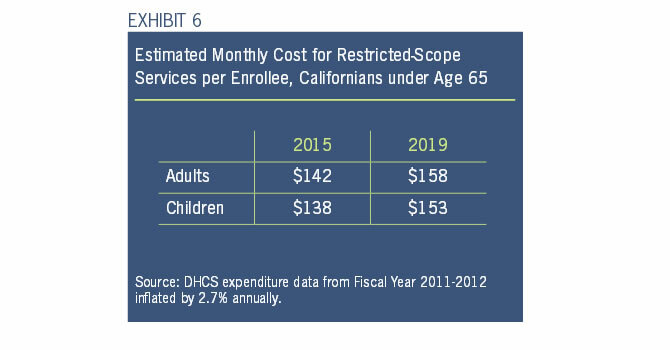 Restricted-scope costs are based on DHCS data on per-member per-month expenditures in undocumented aid codes in Fiscal Year 2011-2012,54 adjusted for 2.7 percent annual inflation, the rate of recent cost increases in Medi-Cal excluding caseload growth. Expanding comprehensive services to children is predicted to involve no additional cost because comprehensive Medi-Cal coverage is predicted to cost less than restricted-scope Medi-Cal per enrollee per month, even before taking into account the research suggesting that immigrant children utilize health services at a lower rate even when they have insurance. It is not known exactly how many of the 130,000 children predicted to enroll under the proposed policy (excluding children with DACA) would be “new” enrollees who were not previously enrolled in restricted-scope coverage. Approximately 142,000 children were enrolled in undocumented aid codes in Fiscal Year 2011-2012, but it is not known how many of those enrollees have since been approved for DACA.55 If some children newly enroll under the proposed policy, the total spending on children could be similar to or less than the spending under current policy due to the reduction in predicted costs for existing enrollees. This analysis assumes that all of the existing and new predicted Medi-Cal spending on undocumented residents would be spent through managed care and would be subject to the Managed Care Organization sales tax. The tax is currently authorized through Fiscal Year 2015-2016, but it is assumed in this analysis that it would be extended. Approximately 57 percent of undocumented Californians live in ten counties where undocumented costs are part of the Health Realignment formula (Alameda, Fresno, Kern, Los Angeles, Riverside, San Francisco, San Mateo, Santa Clara, Santa Cruz, and Ventura).56 The percentage is based on estimates of the number of undocumented residents by county by the Public Policy Institute of California.57 Other counties may experience some savings, like counties with public hospitals that provide emergency care or Contra Costa County which provides non-emergency care to undocumented children, but they are not included in this analysis. Additionally, if any of the ten counties included in this analysis do not experience any savings under the ACA, the state would only be able to redirect any savings from the county if this proposed policy resulted in net savings for the county when calculated with the other costs and revenues that contribute to the formula. In 2015, between 1.4 and 1.6 million undocumented Californians are predicted to remain uninsured. California Simulation of Insurance Markets (CalSIM) model Version 1.91 Statewide Data Book. May 2014 (Forthcoming). These estimates differ from prior CalSIM estimates. In Version 1.91, undocumented individuals who report having Medi-Cal coverage to the California Health Interview Survey (CHIS) are assumed to have restricted-scope Medi-Cal and are treated as uninsured because they lack comprehensive coverage. Senate Bill 1005, the Health for All Act, also proposes to create the California Health Exchange Program for All Californians. This analysis focuses on the Medi-Cal proposal under the bill. The services currently offered under “restricted-scope Medi-Cal” include emergency services, pregnancy-related services, dialysis, and state-funded long-term care services. “Full-scope Medi-Cal,” also called comprehensive Medi-Cal coverage in this brief, includes all ten essential health benefits required under the Affordable Care Act, plus additional services offered in California such as certain dental services. Pastor M and Marcelli EA. What’s at Stake for the State: Undocumented Californians, Immigration Reform, and Our Future Together. May 2013. Institute on Taxation and Economic Policy. Undocumented Immigrants’ State and Local Tax Contributions. July 2013. This estimate assumes average monthly Medi-Cal enrollment of 10.1 million and Medi-Cal General Fund spending of $16.9 billion in 2014-2015 without the proposed policy. Crosnoe R, Pedroza JM, Purtell K, Fortuny K, Perreira KM, Ulvestad K, Weiland C, Yoshikawa H, and Chaudry A (Urban Institute). Promising Practices for Increasing Immigrants’ Access to Health and Human Services. Prepared for the U.S. Department of Health and Human Services, Assistant Secretary for Planning and Evaluation. May 2012. Undocumented status is generally not asked about directly in surveys. Administrative data includes some verified citizens or legal immigrants in undocumented aid codes. This research has been well-summarized in several reports. See for example: Marcelli E, Pastor M, and Wallace S. Ensuring California’s Future by Insuring California’s Undocumented. May 2014. Dow WH, Roby DH, Kominski GF and Jacobs K. New Research Further Strengthens Evidence of the Benefits of the Health Care Safety Net. May 2013. Frakt A, Carroll AE, Pollack HA and Reinhardt U. Our Flawed but Beneficial Medicaid Program. New England Journal of Medicine. Volume 364, Number 16, page e31, 2011. Sommers BD, Baicker K and Epstein AM. Mortality and Access to Care among Adults after State Medicaid Expansions. New England Journal of Medicine. Volume 367, Number 11, pages 1025–1034, 2012. Baicker K and Finkelstein A. The Effects of Medicaid Coverage–Learning from the Oregon Medicaid Experiment. New England Journal of Medicine. Volume 365, Number 8, pages 683–685, 2011. Kolstad JT and Kowalski AE. The impact of an individual health insurance mandate on hospital and preventive care: Evidence from Massachusetts. Journal of Public Economics. Volume 96, Number 11, pages 909–929, 2012. Sommers BD, Long SK and Baicker K. Changes in Mortality After Massachusetts Health Care Reform: A Quasi-Experimental Study. Annals of Internal Medicine Volume 160, Number 9 (2014): pages 585-593. Baicker K and Finkelstein A. The Effects of Medicaid Coverage–Learning from the Oregon Medicaid Experiment. New England Journal of Medicine. Volume 365, Number 8, pages 683–685, 2011. This analysis focuses on the costs for undocumented immigrants whom we predict would enroll under the proposed policy. It is not yet known whether the California Department of Health Care Services (DHCS) would develop unique capitation rates for these enrollees if the proposed policy were adopted. The incremental costs listed here are under the Enhanced Scenario. The costs under the Base Scenario would be approximately $2 higher per enrollee per month due to a different predicted risk mix. Ku L. Health Insurance Coverage and Medical Expenditures of Immigrants and Native-Born Citizens in the United States. American Journal of Public Health Volume 99 (2009): pages 1322-1328. Pourat N, Wallace SP, Hadler MW and Ponce N. Assessing Health Care Services Used by California’s Undocumented Immigrant Population in 2010. Health Affairs. Volume 33, Number 5, pages 840-847, 2014. The trend is similar in both years and enrollment scenarios examined. The full-scope Medi-Cal cost estimates are based on the current costs for families, using DHCS-estimated Mandatory Expansion costs for 2014-2015 including the cost of specialty mental health and dental services, separated into adult and child estimates. The restricted-scope costs are estimated based on DHCS expenditure data for undocumented aid codes in Fiscal Year 2011-2012, adjusted for inflation to 2015. See the appendix for more detail. Research comparing health care expenditures of U.S. born and immigrant children found that immigrant children had lower expenditures on overall health care, office visits, outpatient visits, inpatient visits and prescription drugs, after accounting for immigration status and demographics. The study found that immigrant children had higher emergency department expenditures. Monhanty SA, Woolhandler S, Himmelstein DU, Pati S, Carrasquillo O, and Bor DH. Health Care Expenditures of Immigrants in the United States: A Nationally Representative Analysis. American Journal of Public Health Volume 95, Number 8: pages 1431-1438 (2005). Brindis CD, Hadler MW, Jacobs K, Lucia L, Pourat N, Raymond-Flesch M, Siemons R and Talamantes E (UC Berkeley Center for Labor Research and Education, UCLA Center for Health Policy Research, UCSF Philip R. Lee Institute for Health Policy Studies). Realizing the Dream for Californians Eligible for Deferred Action for Childhood Arrivals (DACA): Demographics and Health Coverage. February 2014. California Governor Brown. Governor’s Budget Summary 2014-2015. January 10, 2014. Sommers BD and Epstein AM. Medicaid Expansion–The Soft Underbelly of Health Care Reform? New England Journal of Medicine. Volume 363,Number 22, Pages 2085–2087, 2010. Kenney GM, Lynch V, Huntress M, Haley J, and Anderson N (Urban Institute). Medicaid/CHIP Participation Among Children and Parents. December 2012. Pereira KM, Crosnoe R, Fortuny K, Pedroza JM, Ulvestad K, Weiland C, Yoshikawa H, and Chaudry A (Urban Institute). Barriers to Immigrants’ Access to Health and Human Services Programs. Prepared under contract with the U.S. Department of Health and Human Services, Office of the Assistant Secretary for Planning and Evaluation. May 2012. Approximately 760,000 Californians were enrolled in restricted-scope coverage in 2012. DHCS. Medi-Cal Member Months Final Quarter Pivot Table – July to September 2012. Wallace SP, Torres J, Sadegh-Nobari T, Pourat N and Brown ER (UCLA Center for Health Policy Research). Undocumented Immigrants and Health Care Reform. Final report to The Commonwealth Fund. August 31, 2012. Children’s enrollment rates in Medicaid and Children’s Health Insurance Program are generally approximately 20 percentage points higher than parents’ rates. This was true both nationally and in California in 2009-2010, according to an analysis by the Urban Institute. Kenney GM et al. 2012. CalSIM 1.91 predicts that between 10 and 40 percent of uninsured citizen and legal immigrant children and adults who were already eligible but not enrolled in Medi-Cal will enroll under the ACA by 2019. UC Berkeley Center for Labor Research and Education and UCLA Center for Health Policy Research. CalSIM Methodology and Assumptions. Approximately 760,000 Californians were enrolled in restricted-scope coverage in 2012. DHCS. Medi-Cal Member Months Final Quarter Pivot Table – July to September 2012. This estimate was reduced by approximately 120,000 undocumented Californians who are estimated to have pregnancy-related coverage or have DACA and are predicted to enroll in Medi-Cal. Passel JS, Cohn D, and Gonzalez-Barrera A (Pew Research Center). Population Decline of Unauthorized Immigrants Stalls, May Have Reversed. September 23, 2013. A forthcoming article discusses the challenges of estimating immigrant populations and the techniques that researchers have developed. Marcelli, Enrico A. 2014. The Community-based Migrant Household Probability Sample Survey, in Marc B. Schenker, Xochitl Castañeda, and Alfonso Rodriguez Lainz, Eds., Migration and Health Research Methodologies: A Handbook for the Study of Migrant Population. Berkeley and Los Angeles, CA: University of California Press, forthcoming. Brindis CD et al., February 2014. Brindis CD, Hadler MW, Jacobs K, Lucia L, Pourat N, Raymond-Flesch M, Siemons R and Talamantes E (UC Berkeley Center for Labor Research and Education, UCLA Center for Health Policy Research, UCSF Philip R. Lee Institute for Health Policy Studies). Realizing the Dream for Californians Eligible for Deferred Action for Childhood Arrivals (DACA): Health Needs and Access to Health Care. March 2014. California DHCS. November 2013 Medi-Cal Estimate: CHIPRA – M/C For Children & Pregnant Women (Policy Change 13). January 3, 2014. California DHCS, Research and Analytic Studies Section. Medi-Cal Births Calendar Year 2006. October 2010. California DHCS, Medi-Cal Funded Deliveries: Table 2005-03 Deliveries to Medi-Cal Beneficiaries by Age and Aid Category, Calendar Year 2005. Passel JS and Cohn D (Pew Hispanic Center). A Portrait of Unauthorized Immigrants in the United States. April 14, 2009. DHCS. Medi-Cal Member Months Final Quarter Pivot Table – July to September 2012. Pastor M and Marcelli EA, May 2013. Hill I, Dubay L, Kenney GM, Howell EM, Courtot B, and Palmer L. Improving Coverage and Access for Immigrant Latino Children: The Los Angeles Healthy Kids Program. Health Affairs Volume 27, Number (2008): pages 550-559. Fortuny K, Capps R, and Passel JS (Urban Institute). The Characteristics of Unauthorized Immigrants in California, Los Angeles County, and the United States. March 2007. Kenney GM et al., December 2012. Communication with DHCS, February 7, 2014. California DHCS. Medi-Cal Expansion to 133% FPL and Rate Increase to 100% of Medicare Annual Costs (Total Funds). July 27, 2009. Pourat N et al, 2014. DHCS. Medi-Cal Fee-For-Service Expenditures by Aid Category – Fiscal Year 2011-2012. DHCS. Medi-Cal Member Months Fiscal Year 2011-2012. Hill LE and Johnson HP (Public Policy Institute of California). Unauthorized Immigrants in California: Estimates for Counties. July 2011. California Assembly Bill X1-1 (2013-2014). Lytle EC, Roby DH, Lucia L, Jacobs K, Cabezas L and Pourat N. Smooth Transitions into Medi-Cal: Ensuring Continuity of Coverage for Low Income Health Program Enrollees. April 2013. California Assembly Bill 85 (2013-2014). California Legislative Analyst’s Office. The 2014-2015 Budget : California’s Fiscal Outlook. We would like to thank Ignatius Bau, Beth Capell, Gabrielle Lessard, Enrico Marcelli, Manuel Pastor, and Jon Rodney for providing helpful comments, and Leighton Ku for sharing his expertise. We appreciate the data and research assistance from Alla Bronshteyn, Max Hadler, Michelle Keller, and Nigel Lo. We thank Jenifer MacGillvary for her help in preparing this report.